The AMCC strives to create an inclusive community spirit through its activities and programs. We have achieved this by embracing diversity as a strength rather than a weakness. The reasoning behind this approach is very simple. Yes, We Are Different–But Why? We are all different people. We’re so different that my fingerprints will not match yours, not even if you are my twin brother or sister. So it’s not surprising that when we start searching for differences, we can find innumerable ones. Our different ages, genders, ethnicities, physical features, and religions might make us wonder: Why did not our Maker make us all in the same mold? What really was the reason to make us different from each other? Was it to demarcate the “better” people from the “worse” people just by comparing their age, gender, racial background, and other traits? Are differences amongst us a reason to celebrate or to agonize about? Similar messages from other faiths also downplay our apparent differences and emphasize righteousness, piety, and peaceful co-existence. So why do some still use our apparent differences as an excuse to create fear, hatred, and violence? As someone aptly stated, it’s very easy to hate a person you don’t know. Diverse groups of people reside in our neighborhoods, often right next to each other. Still, if they don’t really know each other, they will be susceptible to stereotypes. If left unresolved, this situation can create fissures and barriers in society. However, a thoughtful approach can utilize diversity to create a feeling of unity and togetherness amongst all sections of society. Our country has been undergoing increasingly rapid diversification in the last few decades, with more ethnicities, religions, and races adding colors to the great beautiful mosaic. Minnesota is no exception to this trend. Most Minnesotans have welcomed diversity with an open heart. However, a small minority has reservations about this change. Some even fear that their well-established lifestyle is going to be changed by people who are not like them. Lately, Minnesota’s Muslims have been in the spotlight because of several high-profile issues. The recent issues of “flying Imams,” cabbies refusing passengers who’re carrying alcohol, “undue accommodation” for Muslim students in community colleges and allegations against a local charter school have played to some people’s fears about Muslims. However, the real reason behind the fears is a lack of familiarity. Some Muslims are also guilty of harboring similar unfounded fears, and they prefer to socially limit themselves to other Muslims. They fear that their distinct religious and cultural identity will be diluted if they associate with people who are different. However, this fear is justified only if we deliberately hide our differences. If we voice our opinions and thoughts clearly without forcing anyone to accept them, and also recognize the rights of others to voice their opinions–even if we don’t agree with them–we will enrich our society. I believe that common thread is a desire to live in a society that is just, peaceful, and progressive. American Muslim Community Center (AMCC) is a Twin Cities-based non-profit organization that has been catering to the needs of the Muslim community since 2000. We have made a special effort to facilitate greater familiarity and interaction between all faith-based communities. AMCC has organized and participated in several activities that have brought together Muslims, Christians, Jews, Hindus, and people of other faiths for a good cause. AMCC has gone out to paint the homes of the underprivileged, collected food for local food shelves, participated in events showcasing different cultures, and organized joint services and events with Jewish, Catholic, Protestant, Hindu, and Buddhist groups. We have established bridges with people of other faiths, and in the process we have broken down stereotypes amongst all groups, including ours. 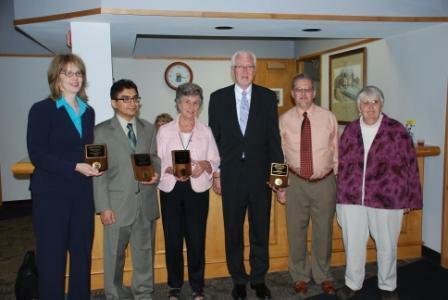 AMCC shares a special relationship with one of the co-winners, Pax Christi Catholic Community in Eden Prairie. Many years ago, when our community was searching for a place to offer its weekly congregational prayer, Pax Christi generously offered us the use of their building, and we have since been using it for most of our community activities. We immensely value this relationship and appreciate their generosity. We also share a warm relationship with the other co-winners, Eden Prairie United Methodist Church and Prairie Lutheran Church. It’s is an honor for AMCC to be accepting this year’s Human Rights Award from the City of Eden Prairie on behalf of the local Muslim community. This award recognizes the hard work and effort put in by numerous members of the community. We hope that we can all continue working together to create better understanding and to build stronger bridges. Autif Sayyed lives in Chaska and is currently the secretary of American Muslim Community Center (www.amccmn.org). Posted on May 26, 2008, in Uncategorized and tagged American Muslim Community Center, awareness, difference, diversity, Eden Prairie, faith, Guest bloggers, Human Rights, Human Rights award, interfaith, Islam, Minnesota, muslim, peace, Qur'an, tolerance. Bookmark the permalink. 1 Comment. Congratulations! What a wonderful article modelling the how to use diversity to reach out to others and help those less fortunate. I am so happy that Muslims are part of the “good news” in the newspapers. May Allah bless this cause and help us to continue to work together.